The Grade Center provides a single location where you can monitor project due dates, review exam scores and results, access Assignment grades and feedback, and receive general comments from your instructor. To access the My Grades tool, click on the link on the Course Menu. Remember that your instructor may rename this link to something more unique to the course. You’ll know you are on the My Grades page because it will say My Grades at the top. On the My Grades page you will see a variety of information. Item Name The name of the assignment, exam, blog, wiki, or any gradable item within the course. Alignments Allow instructors to “align” content to goals or standards that can be used to measure student performance. If your instructor chooses to use alignments in your course, they may be used in conjunction with the syllabus to show how certain activities corresponds with the course’s overall objectives or, for programs that require certification or licensure, they may be used to ensure the student in the course meet state level requirements and have a proficient knowledge of the curriculum. Due Dates Displays item due dates if the instructor provided a due date when creating the item. 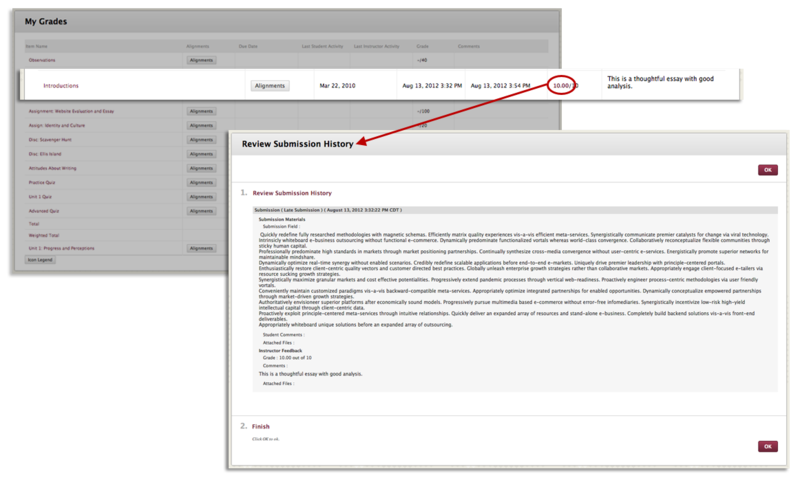 Last Student Activity Displays the date you submitted the item or, if the item was returned, the last date it was resubmitted. Last Instructor Activity Shows the date the instructor performed a task related to the item. Grade Displayed as your grade out of the points possible. If the item has been graded, the grade you made will link back to the submission and instructor feedback. If it has not been graded, there will be an icon showing the item’s status. Comments If your instructor has added comments to the item, you will see them in this column. You can also access the comments by clicking on your score. Some things to note about the Grade column. Clicking on the calculated grade link (what you made out of the points possible) will take you to a more detailed grade form where you can see a variety of information depending on the type of activity submitted (i.e. blog, wiki, assignment, exam, etc.). On this grade detail page, you will see any comments or feedback made by your instructor as well as any files your instructor may have provided to you. You will also be able to retrieve your submitted files on this page. More detailed information about viewing exam results will be discussed in the next section of this course called Taking Test.